Bringing July to a buoyant end, the Rodriguez Group has announced the sale of not one but two new superyachts within the same week. 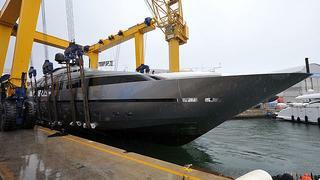 One of the yachts is the 40 Alloy motor yacht 111, whose launch we recently reported. 111 is the seventh hull in Sanlorenzo's aluminum range, which has won accolades at both the World Superyacht Awards and ShowBoats Design Awards. The yacht has both exterior and interior design by Francesco Paszkowski, and features numerous sea balconies. Launched within a similar timeframe, the other yacht sold is a 43 metre Italyachts 'sport-fly' yacht, with exterior design by Andrea Bacigalupo and an interior by designer Cristiano Gatto which features white leather and lacquered wenge. Remarkable for its 18 metre main saloon, the yacht comes with a choice of three layouts with different cabin configurations. This particular yacht is a five cabin version. Three MTU 16V2000 M94 engines produce a cruising speed of 30 knots and its propulsion system - two Kamewa Rolls-Royce waterjets and a Booster 71BII - is free from noise and vibration.